Selection of 55 WWI Censor covers sent from the Middle East and Europe to a correspondent in Melbourne with a range of Field Post Office cancellations, Censor and postal markings. A variety of Y.M.C.A. and Red Cross envelopes, many containing original correspondence, as well as a few Field Service Post cards. Some covers tatty as you would expect, but many in fair to good condition. Also bundle of letters sent from correspondent in Melbourne. 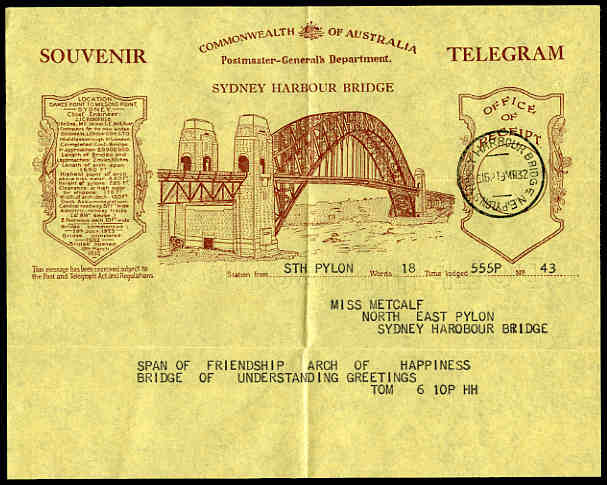 1932 Sydney Harbour Bridge Souvenir Telegram form and matching window envelope, both with Sydney Harbour Bridge NE Pylon 19 MR 32 CDS postmarks. Superb condition. 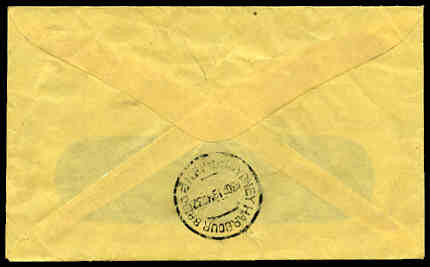 1945 Cover with cachets "H.M.A.S. "Shropshire" Official Signing Of Japanese Surrender" and "H.M.A. SHIPS" on front and "Commodore Commanding H.M. Australian Squadron. OCT -2 1945" on reverse, stamped with 5½d Emu tied by Tokyo CDS postmark, plus similar cover with "H.M.A.S Hobart Tokyo Japan 2 SEPT 1945" cachet, stamped with 3d Brown KGVI tied by barred oval postmark. "Shropshire" cover taped around edges. Selection of 31 items including receipts, some with duty stamps, broadcast licences, tax returns, invitations and other miscellaneous items. 1951 3½d Red KGVI Lettercard, addressed to U.S.A. in September 1952 and uprated to 8d with the addition of a 4½d Red KGVI stamp. Scarce usage. 1952 OHMS local Registered cover franked with a pair of 1952 4½d Red KGVI and a 1951 3½d Brown KGVI to make the 1/0½ rate. Unusual usage. Selection of 443 plain covers with CDS postmarks of various towns and suburbs or special commemorative postmarks. Mainly Tasmanian CDS postmarks including many smaller or closed offices. Circa 1966 to 1996. Some duplication. Selection of 148 covers from 1963 to 1990 cancelled with special or pictorial postmarks, with main strength in the 1970's period. Odd fault. 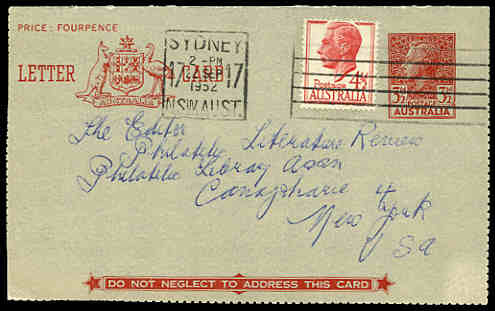 1973 Commercial cover from France to Australia, returned to sender, with sticker on reverse in French stating that Australia has suspended all postal relations with France. This was due to Australian Government sanctions against France, because of their nuclear tests in the Pacific. 1975 Commercial window envelope cover opened flat, franked with 18c Wildflower with Violet Cachet "Priority Paid - Test Article. This Article has been used to test the Priority Paid service for handling urgent intrastate mail." This item was selected from the non priority mail stream by the Post Office and had a Priority Mail label affixed. Accumulation of 933 Maximum Cards from 1978 to 2006 including many sets and duplicates. Also 1988 Bicentennial Exhibition 60¢ and 80¢ postcard set of 2 (21 sets, 3 cancelled FDI), 1988 60¢ and 80¢ Expo postcard sets of 6 cancelled FDI and 1990 Melbourne's Olympic Bid postcard set of 3 (7 sets, 3 cancelled FDI). ASC P49-P53. High retail value. Accumulation of 447 Priority Paid commercial covers, mainly from the 1980's with a variety of frankings used and a wide variety of Priority Paid postal markings. Odd fault and a few opened flat. Complete set of 589 Australia Post Maximum Cards cancelled on FDI from 1986 America's Cup set to 1998 Christmas set, with some extra items, housed in special 6 volume Seven Seas album with slip cases. Very high cost price. Accumulation of 645 covers from 1929 to 1950's including First Day Covers, commercial covers, meters, special postmarks, advertising covers, Airmail covers, Registered covers and more. Some handy items and Foreign content. Condition varies. Accumulation of 636 covers and miscellaneous items including First Day Covers, commercial covers, special postmarks, Australia Post Country Press folders, old share certificates, cinderellas, replica cards, maximum cards, old theatre programs and more. Some foreign content and few faults. Selection of 82 First Day Covers, Registerd covers, commercial covers and Postal Stationary items from 1886 to 1985 including some special postmarks. Noted 1886 cover from London to Australia franked with 1884 6d Dull Green Queen Victoria with small tear and Queanbeyan and scarce Canberra backstamps. Varied condition. Accumulation of thousands of slogan and some CDS postmarks on piece in carton with strength in the 1960's. Also some U.S.A.
Accumulation of 357 First Day Covers, Airmail covers, Censor covers, Registerd covers, Postcards, commercial covers and Postal Stationary items from 1925 to 1963 including bilingual pairs, special postmarks, cinderella's and some duplication. Noted 1925 Airmail cover from Johannesburg to England, franked with 1925 Air set, 1929 Inaugural return flight Airmail cover from London to Port Elizabeth and 1934 Airmail cover from South Africa to Australia with Brisbane 21 DEC backstamp, both franked with 1929 Air set, 1933 Voortrekker pairs set on Trek covers (2, one with Cape Town special postmark), 1936 Jipex Philatelic Exhibition miniature sheet set on FDC's (3 sets), 1938 KLM First Flight cover from South Africa to Holland, franked with 1938 Voortrekker Centenary pairs set and Voortrekker Commemoration singles set, plus pairs sets on FDC and 1939 Huguenots Landing set in pairs (2) and blocks of 4 on FDC's. Some minor faults, but generally fine condition. Accumulation of 545 First Day Covers, Airmail covers, Souvenir covers, Postcards, Balloon Post covers, Postal Stationery items and commercial covers from 1854 to 1990 including many special or commemorative postmarks and some duplication. Noted 1918 Airmail cover from Lemberg to Vienna, franking includes "Flugpost" set on greyish paper, 1935 Austrian Heroes set on plain FDC, 1935 1s + 50g Winter Relief Fund on registered express post cover, 1936 5s Definitive on plain cover with "Der Fuhrer Mien" cachet, 1936 Austrian Inventors set on illustrated FDC and 1949 Child Welfare Fund set on First Day registered censor cover. Odd fault, but generally fine condition. Selection of 67 mostly early covers or postal stationery items including some Bavaria and Wurtemburg, mainly used with an interesting range of postmarks. Few faults. Accumulation of 1,841 covers or postal stationery items from 1870's to 1990's, mainly stuck in sketch books including Registered covers, Allied Occupation covers and Censor covers. Main strength from 1940's onwards, but includes interesting range of earlier items and handy frankings. Some Australia and Foreign content. Varied condition. Selection of 384 covers or postal stationery items from 1870 to 1995 comprising mostly Commercial covers, First Day Covers, Airmail covers, Censor covers, Postcards and Embossed Envelopes. Interesting range of early Airmail covers from the U.S.A. including some internal covers with various cachet's including 1925 U.S.S. "Los Angeles" Zeppelin Flight cover from New York to Hamilton, Bermuda and 1936 First North American Zeppelin return Flight cover from New York to Frankfurt. Odd fault, but generally fine condition. Comprehensive collection of 986 mainly different Space covers from late 1950's to early 1990's including Apollo, Space Shuttle Training and Test Flights, Rocket Launch, Retrieval and Satellite Tracking Station Covers with a wide range of cachets and many signed covers, plus 86 NASA Astronaut and Promotional publicity photographs. Interesting lot with some Foreign content. 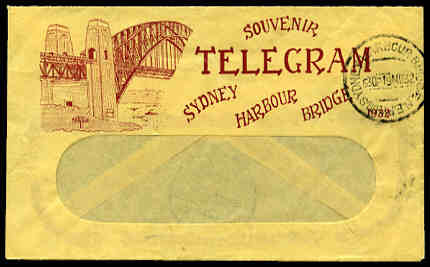 Selection of 114 covers and postal stationery items, mainly from Australia including interesting range of earlier items. Noted 1918 Three Halfpence on 1d Red KGV and 1921 1½d Brown KGV postcards used, 1930 South Lucknow Extended Gold Mining Company share certificate, 1936 SA Centenary set on illustrated FDC, 1936 Tonga Tin Can Mail cover, 1937 Jersey to Southampton airmail cover with cachet, 1938 Pitcairn Island establishment of radio communication souvenir cover with cachet, 1941 Fiji to New Zealand airmail cover with cachet, New Hebrides English and French 1949 UPU sets on registered FDC's, 1952 3d Green KGVI postcard mint, 1957 4d on 3d Green Die II QEII postcard (3, one cancelled FDI), 1966-71 Australian Force Vietnam Envelopes (2, one cancelled Aust F.P.O.) and other handy items. Odd minor fault. Accumulation of 474 First Day Covers, First Flight covers, special postmarks and miscellaneous items from 1932 to 1985 with main strength in Australia. Noted 1932 2d and 3d Engraved and 2d Typo Sydney Bridge on registered cover cancelled with Sydney Harbour Bridge NE Pylon 19 MR 32 CDS postmarks, 1934 New Zealand to Australia First Flight cover franked with 7d Trans-Tasman Airmail issue, 1955 Singapore to Australia FDC franked with 1955 QEII Definitive set and other handy items. Condition varies. Large carton containing accumulation of many hundreds of covers and miscellaneous items from a range of countries with strength in Australia including First Day Covers, Maximum Cards, commercial covers, postal stationery items and more. Shoebox containing accumulation of hundreds of covers, modern picture postcards, postal stationery items and more including commercial covers, FDC's and special postmarks. Accumulation of Postcards, First Day Covers, Postal Stationery and miscellaneous items, mainly from the 1940's to late 1960's, plus off paper mixture in small box. Noted 20 Woomera Rocket Launch covers from 1966 to 1970 with AAMC catalogue value of $460.00. Accumulation of 982 covers, postal stationery and miscellaneous items from a range of countries and periods including First Day Covers, Special Postmarks, Postcards and more. Noted 1891 and 1892 Victoria Miners Right, Ross Dependency 1958 cover signed by Sir Edmund Hillary, numerous Antarctic Research covers and modern range of Solomon Islands and Tuvalu official unaddressed FDC's. Accumulation of over 2,200 covers, postal stationery and miscellaneous items from a range of periods and countries including Commercial covers, First Day Covers, Registered and Certified covers, Underpaid covers, PSE's, Special Postmarks, Postcards and more with duplication. Main strength in Australia and USA. Condition varies. Accumulation of thousands of registration labels from a range of countries and periods in small box.